It’s not the easiest place to find, hidden away on the second floor of a building in Li Yuen Street East, but Thai Thai Grill is worth seeking out. That's why it was disappointing to only see a handful of people in the dining room on a recent night. 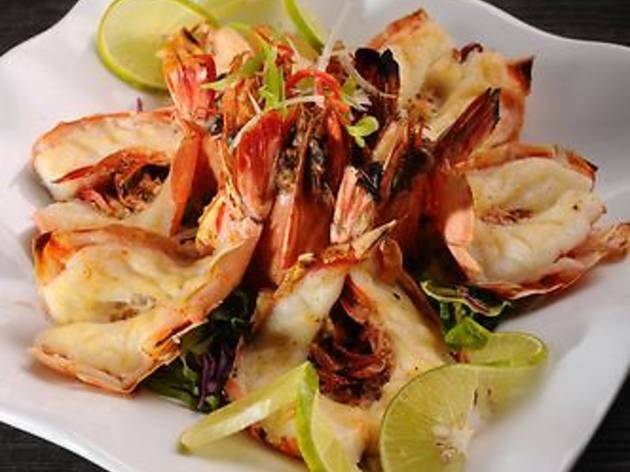 Their grilled tiger prawns (three pieces, $198), served butterflied and coated with lime juice and chilli sauce, were meaty, salty-sweet, and juicy, with just the right amount of char. The head-left-on presentation also allowed for the appropriate sucking of the brain. The grilled squid ($98) came with an electrifying spicy sauce on the side, and would have been in trouble without it. Lacking excitement, it could’ve used a bit more time on the grill at the very least. We always find it risky ordering softshell crab. So often it comes out as a soggy mess. Not the case here. The papaya salad with softshell crab ($68) had the crustacean’s body split into five sections for easy picking, while the batter was light enough not to overpower the flavour of the crabmeat. The whole thing was enlivened by the punchy papaya salad. Delish. We had to give the curry a shot as well and chose the Penang chicken ($72). It was good to see a dish denoted ‘very spicy’ that actually was. The thick curry had an impressive bite that was tempered somewhat by the sweet coconut milk, and the portion was the perfect size for one person. We finished with that old Thai standby, mango sticky rice ($48). While not the hardest dish to execute this was a fine rendition, with appropriately ripe mango and perfectly cooked rice. 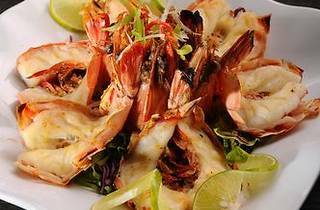 The rest of the menu is fairly seafood-centric and thus prices can be a bit higher than Rat Alley or your local Thai hole in the wall, but chances are you’ll leave feeling that those extra dollars were well spent. 2/F, 9 Li Yuen St East, Central, 2167 8338. Daily 11am- 11pm. Meal for two: around $650.